1 Why does the South Indian Film industry need to make a movie on Lord Shiva? 3 Why Bollywood Lack of confidence in Vedic traditions? 4 Why is Audience looking towards South Indian film Industry? 5 why the South Indian film industry has the potential? Why does the South Indian Film industry need to make a movie on Lord Shiva? We are living in the Marvel and DC world where Hollywood fictional characters have taken control of our thought process by putting imaginary characters on our mind. Whereas, most of us are the explorer of the past greatness who wants something which should bring back originality to our life. Movies on Lord Rama, Lord Krishna, Lord Hanuman, and many other more influential characters can introduce the modern generation to their past glory. In such situations, People wanted to reconnect with their roots. An epic Movie on Shiva Lord can do that. A movie introducing the qualities of Lord Shiva can impact so much to the youth. After going through the Greatness of Lord Shiva, people could understand and value the meaning of righteousness. A movie which could tell everyone how to connect with Shiva? So that they could lead their life towards spirituality, and eternal joy. Just by making an epic movie on Mahadev international audience could get aware of the vibrant energies within everyone. The most significant thing is to rightly manifest the divinity of Lord Shiva as the destroyer of darkness on the silver screen, and that requires efforts and knowledge about robust Vedic tradition. The new generation is already familiar with Lord Shiva facts and Movie on Shiva can showcase the Teachings of Lord Shiva. Lord Shiva is the supreme being who is known as the omniscient and the greatest transformer. Lord Shiva is known for his charismatic persona, compassion, and unbelievable strength. Therefore, there are many lessons which people can learn from Lord Shiva. Shiva is one who is the major influential lord in the Santana Dharma without whom trinity is incomplete. The movie could become a platform to spread Vairagya. People will automatically start realizing Shiva inside and outside their existence. Lots of people will come to know that from Demons to demigods everyone has faith in Shiva which is why Shiva has an enormous list of his devotees. They adore Shiva as Bholenath. Shiva is unique, and there is no one like Lord Shiva who is known for his generosity. A supreme hero who is known as catastrophic Rudra, and has the third eye on his forehead. He carries trident on his right hand, and Shakti is his better half. Many times Shiva protected the entire universe. Shiva neutralized demonic kings like Jalandhar, Andhakasura, Bhasmasura and many other. Protected moon from getting faded. The beauty of India is that it has unity in diversity. Language is no barrier to film audiences. Film critics and audiences love the right kind of art and Cinema. We understand that art has no boundaries. For Indians, both Bollywood and other Indian film industry are one. We are proud of the ethical cinema industry. Still, there are few things where the South Indian film industry seems superior over Bollywood. Bollywood seems to limit to love and romance movies only. Whereas, other industries like Tollywood has more beautifully presented the art and culture of India to the world. Therefore, If you compare the south Indian film industry with Bollywood, you can judge that Bollywood doesn't have the ability to portray Bhootnath Shiva. Why Bollywood Lack of confidence in Vedic traditions? Bollywood is afraid of doing different and unique. It requires a gut to think creative which they lack. They are limited to Love and revenge stories only. They can't go beyond that. Bollywood is known for making crap these days; only a few movies were sensible like Dangal, Ms. Dhoni, Parmanu (The Story of Pokhran). They were nice because they were realistic films leaving a positive message behind. It is the reason; people appreciated the movie with their heart. Why is Audience looking towards South Indian film Industry? South movies are loved and admired all over the country and overseas. Moreover, south superstars are known for their down to earth attitude. Audience remembered the simplicity of Prabhas on the launch of Bahubali - the conclusion. Actors like Rajnikanta, Alluarjun, Mahesh Babu, Prabhas, Ram Charan became new Indian superstars. They openly showcase their love for their motherland (India). why the South Indian film industry has the potential? They are focusing on quality work, not on quantity work. They are free minded people who love their heritage. They are not obsessed with the few stars. Lord Shiva has a great physique. Most importantly, Shiva doesn't have the blue color. Indeed, Lord Shiva has white camphor in color. We all know that Lord Shiva smears dead body ashes on his body. He has a special connection with cremation ground ashes. Therefore few Bollywood actor suits for Shiva role. John Abraham - Force, Madras Cafe, Parmanu, Rocky handsome and Saya. These are the few movies where John showcased his acting talent and great physique. Hrithik Roshan - Without any doubt, Hrithik can play the role of Mahakaal. We have seen him in Krish series. Prabhas - Prabhas can perform the dynamic role of Lord Shiva. He has the similarity of Lord Shiva. Allu Arjun - Allu has excellent style and perfect attitude to perform Shiva's role on the big screen. For inspiration, the South Indian film industry can look towards Devon Ke Dev Mahadev Show. Show Dialogue by Mohit Raina - "Main to Vairagi hoon, Na sammaan ka Moh Na aapmaan ka bhaay" is loved by all. After Bahubali - the beginning, Bahubali - the conclusion, Enthiran, Tik Tik Tik, South Indian film industry can also make an epic film on Lord Shiva. 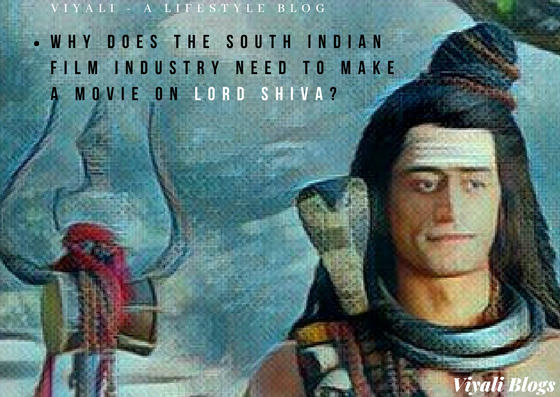 In this post, we have answered Why Indian film industry needs to make a movie on Lord Shiva? If you liked the post, please feel free to share it on the web so that others could know the reason. If you liked this post, please like our facebook page and don't forget to follow us on Twitter. You can also subscribe to our blog via Email.